A wireless doorbell is basically a system to alert you to a visitor, so why spend a lot of money? 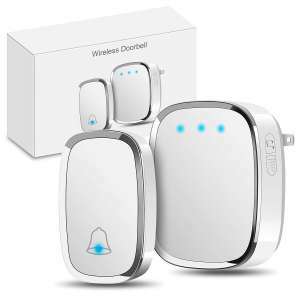 You do not need to spend big to get an awesome wireless doorbell, so here we are going to take a look at some cheap wireless doorbell options. First up, if you simply want to know the top 3 cheap wireless doorbell options, then take a look directly below. We cover the whole 5 in more detail later. Cheap Wireless Doorbells – Are They Good Enough? Do you need multiple receivers? 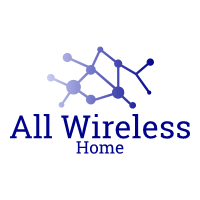 Do you need a long range wireless doorbell? Do you need video integration? Do you need a high waterproof rating? 1byone have some excellent wireless doorbell options, and the 1byone Easy Chime Plug-in wireless doorbell is certainly no different. 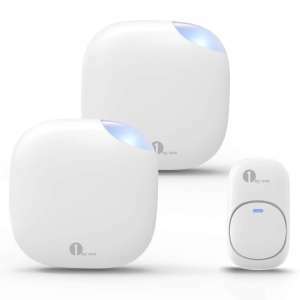 The 1byone Easy Chime Plug-in wireless doorbell is the lowest priced wireless doorbell on this page AND has everything you need for a cheap wireless doorbell. 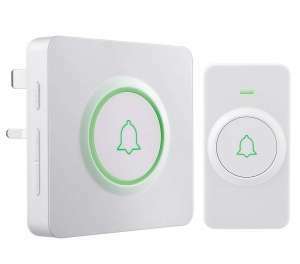 If you are looking for a cheap wireless doorbell, you cannot go wrong with the 1byone Easy Chime. We love the Avantek wireless doorbells! We have already reviewed a number of them. There are many reasons why we love them, and one of them is because they are very cheap for what they are. The AVANTEK wireless doorbell is certainly no slouch when it comes to the features offered! For a start, this wireless doorbell works at OVER 1300 feet! When you really think about it, the distance is probably a lot more than you need, but at least you know it is available. Most of the Avantek models are great options for all situations, including the need for a cheap wireless doorbell. They have made on onto our list of best wireless doorbells, long-range wireless doorbells, loud wireless doorbells, and wireless doorbells for cold weather. They really are the jack of all trades and the master of most of them too! We have no doubt that this Avantek deserves a place on this list. You may find another one on here too…. You guessed it! Another AVANTEK! This time, we are looking at the AVANTEK D-3F Waterproof Wireless Doorbell, which is a beautifully crafted wireless doorbell that is designed to suit any home. With similar features to the option above, it is difficult to choose between them. In fact, although this is in 3rd place, I prefer to see them both as joint 2nd. The features are exactly the same, the only difference being that the AVANTEK D-3F Waterproof wireless doorbell is slightly more expensive, but not by much. If you are looking for a cheap wireless doorbell, the AVANTEK D-3F is a great choice! 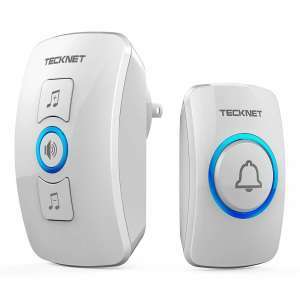 As part of our wireless doorbell reviews, we have already had a look at the TeckNet Waterproof wireless doorbell. Feel free to check out the full review here! What we found was an awesome, and cheap wireless doorbell. The only thing that lets the TeckNet Waterproof wireless doorbell down is the low waterproof rating. Further down this post, we advise that the lowest waterproof rating is IP33, and the TeckNet Waterproof wireless doorbell is the lowest we recommend. Having said that, the push button should be absolutely fine outside in the rain. As you can see, the TeckNet Waterproof wireless doorbell is a good option if you are looking for a cheap wireless doorbell. It is one of the cheapest options on here, which is surprising due to the solid build and the fact that it is very dependable. As we said, the only reason it is not in the top 3 is the waterproof rating. The Govee waterproof chime kit is a fairly new wireless doorbell, but it certainly comes at the right price! One of the standout features of the Govee IP44 waterproof chime kit is the LED on the front of the receiver. This is a good, cheap option for those who are hard of hearing or completely deaf. Another awesome feature is the waterproof rating. I know we keep discussing it on this page but it really is one of the most important features of a wireless doorbell. Especially if you need a cheap wireless doorbell because you do not want to be buying a replacement in the event of water damage. IP44 is a good waterproof rating for a wireless doorbell, which is exactly the rating they have given the Govee IP44 waterproof chime kit. As we have said, this is a new wireless doorbell, otherwise, it may have found itself further up this list! At the current price, it is an absolutely top deal. There is no short and sweet answer to this question. It depends entirely on what you need in your wireless doorbell. If you are looking for multiple receivers, then a cheap wireless doorbell can be a very good starting point. Take the Avantek. With this model, you can start with a single wireless doorbell receiver and add more as you need them. Extra Avantek receivers can be purchased. 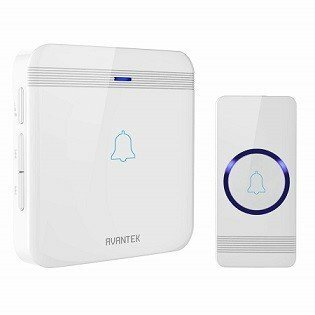 Whilst you are unlikely to get a cheap wireless doorbell with more than 1 receiver, you can get an option that has extra doorbell chimes available to add on. You may find that the cheap wireless doorbells have a limited range. Having said that, if you take another look at the Avantek you can, in fact, have a cheap wireless doorbell that can work at over 1300 feet! Keep this in mind when you are looking for a cheap wireless doorbell. Does it offer you the range you need? Whilst none of the wireless doorbell options on this page have video integration, you can buy an option that is cheaper than you think. The Ring wireless doorbells have video integration but are expensive. A cheaper wireless doorbell with video integration is the Ring 1 video doorbell which offers more or less the same functionality, albeit with slightly less resolution. As the wireless doorbell pushbutton is likely to be placed outside, it is going to be exposed to the elements. That includes a lot of rain! When you are placing the push button in the rain, it is obvious that it needs to be waterproof. We have put together a waterproof rating post which gives you a rundown of the IP rating that most wireless doorbells are measured against. When putting a wireless doorbell push button outside, it really needs to be IP33 or higher. When buying a cheap wireless doorbell, you really cannot afford to go any lower than IP33, or you might end up buying another when it is damaged by the water! As I said above, you do not have to spend big to get a feature-rich wireless doorbell. Buying a cheap wireless doorbell will get you an option that is more than good enough! As long as you have covered everything you need, then you can go ahead and buy one. Remember that when you are looking for a cheap wireless doorbell, ensure you do not compromise on quality. If you go for the cheapest option, read through the reviews to get a feel for the quality. You do not want to be buying another wireless doorbell in a few months because you have been let down by the quality! All the options on this page are well worth the investment.